Grava 4 was released midway through the Storm series and can now be recognised as the first and final post Storm album and understood in the light of the seven preceding Storms. The first question is why was it not held back till the Storm was over? I suppose Drexciya were very much in release mode at the time and since the other Storms didn’t come out in order either it wasn't a big issue. For the US based Drexciya to liase with one European label is one thing but when you put five in the equation things can get complicated. With 8 albums and various 12”s coming out over this 2 year period, if there wasn't to be a clash then any release windows which arose would have to be taken advantage of. I would imagine Drexciya were reasonable about this, knowing this is still a business for these labels. 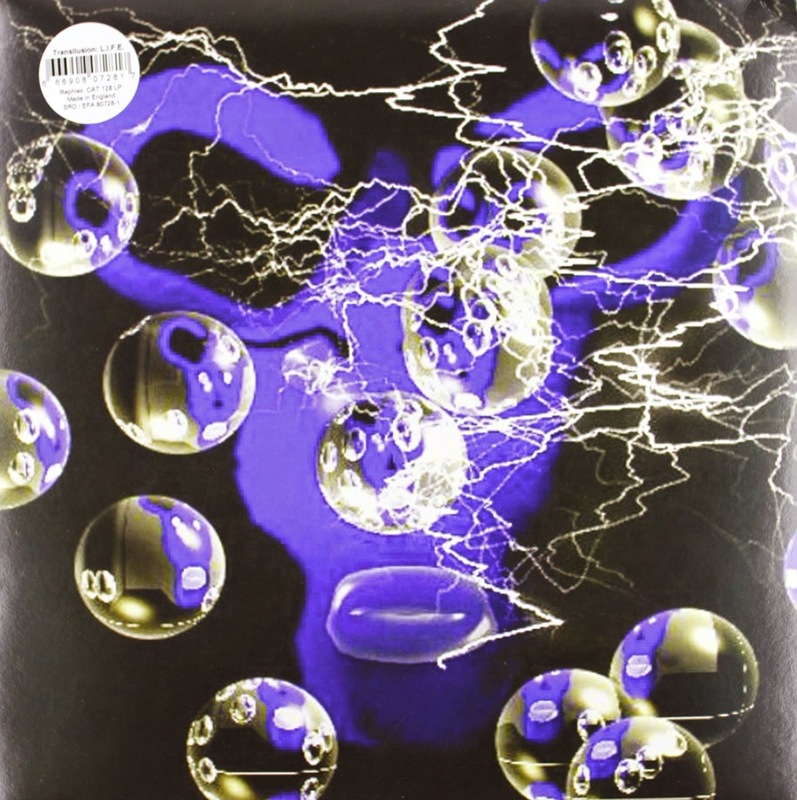 Clone put out this album and may well have been poised to become Drexciya’s main label if things had worked out differently. They did go on to release Gerald Donald's second Der Zyklus album along with becoming something of a Drexciyan archivist by re-releasing some of their earliest music with the L.A.M. and Glass Domain 12”’s, not to mention the mid Storm The Other People Place 12”. Another reason why Grava 4 came out when it did may be because there was obviously some delay with Lab Rat XL, which was the final storm to be released and came out on the Clone sub-label Dub, and as Grava 4 was ready to go it might have been a good substitute. The title Grava 4 must mean something, it sounds so specific, the only things that come to my mind is that it might be short for gravity or else is the name of the universe itself, the 4 meaning the 4 planets. I had originally thought that it could clear up the mystery of the missing track number 4 which has turned out to be a mistake on the CD artwork. The title is actually 'Gravity Waves'. The phrase ‘Drexciya presents Grava 4’ in the sleeve notes gives the album a certain importance, this is unusually grandiose wording for an album and more akin to a movie credit. Certainly the impression it gives is that we are to approach this album differently than usual. The next line goes on to justify the wording, ‘Earth has finally discovered Utopia. (Drexciya Home Universe). This is an event worthy of celebration indeed and I believe ‘presents’ makes more sense in this context. It seems obvious that the Drexciya Home Universe is a metaphor for Utopia. If the Storm series was leading us towards an evolutionary jump of consciousness then any mention of Utopia immediately proceeding it should be taken as the end result. It's quite exciting to imagine where Drexciya would have taken us next. But in a way it makes so much sense to leave it at this stage, where can you go once you find utopia? If James Stinson had lived maybe they would have just ended up reiterating this destination and ways to attain it in varying degrees. He was lucky he lived to see his vision through to its conclusion. Maybe this is another reason the album came out when it did, as Stinson knew it had to come out at all costs. It could likely have been in a finished state for sometime as well. A 12" did come out to accompany the album but it only featured tracks from the album and no additional titles or information, although it has become known as Gravity Waves for some reason. Probably because Clone listed it as such just to have a title to sell it easier rather than list it as untitled. As mentioned there was a mistake in the album artwork which did not list track number 4, said to be 'Gravity Waves' but on the 12" there is also a mistake in that the listed 'Drexcyen Star Chamber' turns out to be the troublesome track number 4 of Grava 4, 'Gravity Waves'. Confusing, I know! The big talking point about this album at the time was that Drexciya had officially named a star after themselves. It's really beautiful that in the future there will always be a star named ‘Drexciya’. Perhaps there will come a time when people look back on our time as we think of Atlantis. Granted some disaster would have to befall the Earth, but give it enough time and it could happen, the things to be saved would be any records of human learning like medicine, agriculture, maps and why not star charts. Some day an archaeologist of the future might even unearth artefacts regarding Drexciya and a legend would be born about the people of the planet Drexciya. The exact wording of the sleeve notes was ‘The star chart is authentic; you will be able to find the star by using coordinates on the star chart. The planet Drexciya can be found in the international Star vault in Switzerland and recorded in the astronomical compendium. (your place in the cosmos, volume 6) copyrighted in the USA available 2003.’ The website which they used to do this is at http://www.starresistry.com Sadly they don’t give you the option to look for previous entries, it’s basically a money making scheme. The artwork here has no more production credits to Dimensional Waves or even any Drexciya email addresses either which marks the album out as separate from the Storm series too. Even the return of the name Drexciya in this context, not used since Storm #1, can be taken as a sign that the Storm series is over. The text goes on to say, “Earth scientists discovered the home planet Drexciya on 2-14-2002. 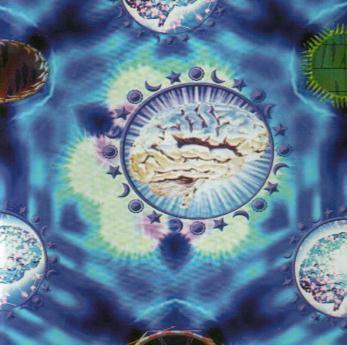 Within moments Dr. Blowfin was given the orders to initiate the seven dimensional cloaking -spheres to hide the other three planets from Earths view.” As we have discovered, the 7 cloaking spheres are the 7 dimensional waves/Storms which created a shield/puzzle which when figured out did indeed reveal our destination of this Utopian place. I'm inclined to believe that the date is simply the day their star was registered, by now the studio work would have long ceased, although the artwork and titling as we know from previous releases in the series went on right up to manufacture. The long and slowly lethargic opener 'Cascading Celestial Giants' seems to soundtrack a rebirth or re-emergence for Drexciya. The hymnal vocal sample gives it an epic, even religious feel, hinting that what we are about to access is something special. 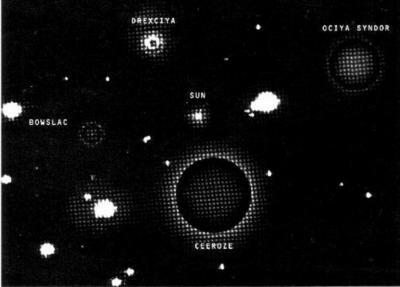 The celestial giants are probably a reference to the two largest planets in the Drexciya home universe, Ceeroze and Ociya Syndor or all four of them (which are shown on a map in the artwork). As a side note the musical template for this track would not have been out of place on Dopplereffekts Linear Accelerator (2003). ‘Powers of the Deep’ sounds like a pre Storm era title but in this context could mean deep space and is another slow contemplative number. ‘Ociya Syndor’ of course brings us full circle from the very first Storm’s ‘Mission to Ociya Syndor and Back’. It seems unlikely that all of the four planets in the Drexciya Home Universe would be habitable, we only have to understand the basic principles of our own universe to understand that. The sleeve notes tell us that the home planet is Drexciya, which leaves us asking what’s with Ociya Syndor, is this their Mars, only colonised? Whatever it is, Ociya Syndor is central. Maybe if James Stinson had lived they would have gone on to explain and build a mythos to go with this universe too. A simple colonisation may well be the answer, on the map it's certainly a larger planet than Drexciya and would be the obvious choice for an expanding civilisation. Ceeroze looks too close to their Sun. I wouldn’t be surprised if tiny Bowslac would also have turned out to be colonised, being about the same distance from their Sun as Drexciya. ‘Drexcyen Star Chamber’ finally breaks into a sweat with a more recognisable pacey electro edge and sounds like it could have originated from L.I.F.E. material. The title sounds like an attempt to build a history around this newly revealed location. This star chamber may be a place to view a map of the Drexciyan universe. I am drawn to view this as more ancient than modern by the archaic language used to describe it. The ancient Egyptians would have had what would pass for a ‘star chamber’ and we have already had a reference to the Egypt obsessed Sun Ra on the final storm. Although I think we need to look towards another ancient but equally as mysterious culture to cover all the possible historical origins that this album is hinting at. I would recommend to investigate the African Dogon tribe as a possible influence here. They are famous for having detailed astrological information about the Sirius star system which was then unknown at the time. Their whole belief culture is based around this. This could fit with the title ‘Hightech Nomads’ which sounds very future primitive, whether these people would be found on Ociya Syndor or Earth is up for debate. 'Drexcyen R.E.S.T. Principle (Research. Experimentation. Science. Technology.) has been mentioned before in the press release for Lab Rat XL and I discuss it in that piece but this is basically the method used by Drexciya for doing tracks. One additional piece of information is that this is not the first time this type of phraseology has been used. As a sort of subtitle on the Neptune's Lair album it reads 'Scientific Research Development Lab', this theme is so strong and consistent with Drexciya that it even influenced the title of this blog. Research is key. '700 million light years from Earth' must be giving us the distance of the Drexciya Home Universe from Earth. 'Astronomical Guidepost' has a vocal and ends off the album in a cyclical fashion as I will show. The sentence, "Use the star chart to fix a celestial navigation point, from there you should be able to plot your path back to Earth using rudimentary astronomical guideposts." sounds like it was sampled from somewhere and neatly brings us back to Earth, therefore completing the mission from Storm #1, Harnessed the Storm, to get to Ociya Syndor and back. It's nice the way the music drops away for the final vocal sample and the album ends, it seems these are our instructions and so our journey home begins. It strikes me that the naming of the Drexciya inspired Aquanauts could itself be a hint at what was coming next after Grava 4, Drexciyans in space, wouldn’t Aquanauts be the perfect way to describe that? Maybe Stinson had explained his new concept to his UR brothers, lets hope so. Speaking with Osselaer Stinson talked about the Storms as hitting Earth, “...seven storms released around the world. So far three of the seven storms have hit Earth. The next four storms are in a holding pattern.” This totally ties in with conceiving of the storms coming from outer space. For them to effectively hit all over the Earth this would also explain why multiple labels were necessary. Also in the Osselaer interview he gave one of his only references to anything post-storm, "Some of the things of slavery will tell more when the time comes. Stay tuned! I can only tell you a little bit now. After the storm is over I will tell the story. What I can tell you is that in Africa we have a dimensional jump hole. Tell you more later." This is a major hint at what was to come, tragically it wasn't to be but I've put together a possible scenario which Drexciya may have used next to reveal their history and future direction. As I’ve said before, this is only my interpretation. 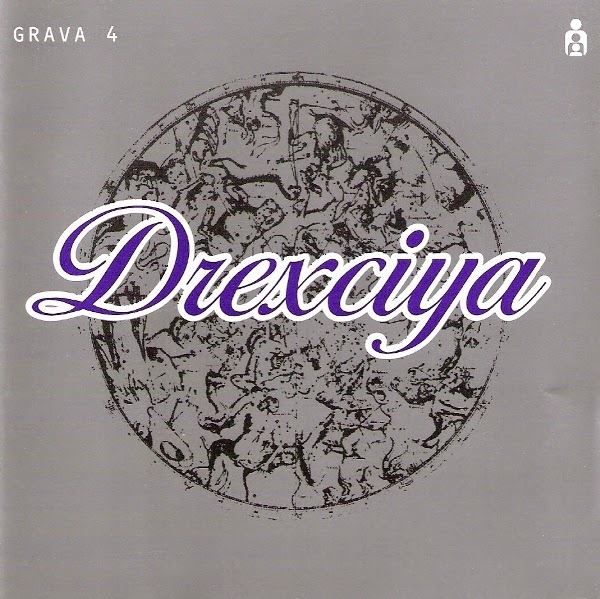 Drexciya chose to create a mystery so we could think for ourselves. 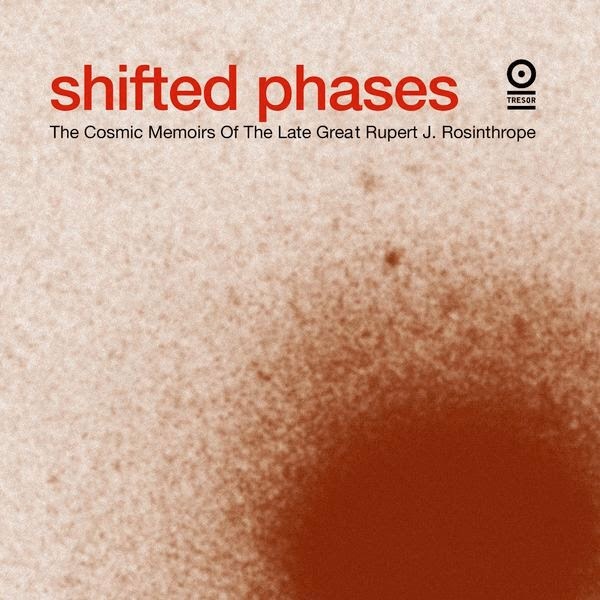 Storm #7 is the Shifted Phases album The Cosmic Memoirs of the Late Great Rupert J. Rosinthrope. The hidden element to this storm is that what we have here is a map to the Drexciya home universe. As I have said previously in many ways this bookends Storm #1 very neatly in that the theme is self contained. This Storm is also on Tresor too so there’s a kind of join there but that could be just coincidence. Shifted Phases immediately conjures up images of changing dimensions, realities whose frequencies are phased just out of step to be different from each other. Maybe this would be something we need to do to ever hope to reach the Drexciya home universe in a human lifetime. Perhaps one of the unnamed biological experiments on Lab Rat XL would have been to reconnect this part of our brain with this universal mind, that would be evolution indeed. The album title seems to be telling us that it contains the life story of an individual. Well first of all, like most people interested I put Rupert J. Rosinthrope in a search engine when the album first came out and came up with zilch outside references to the album. So we know the name is their creation at least. These memoirs are not of course an account of an everyday existence either, for these are cosmic memoirs. I would say that this man represents mankind and this is the entire history of man being recounted one last time. The ‘Late Great’ phrase certainly hints at something bigger than this being just about an ordinary man. There was a huge bestseller, in the 1970’s I think, about the possibly factual end of the world according to the book of Revelations. It was called the Late Great Planet Earth which they might have been thinking of to signify how big this evolutionary step could be. I’m not saying there is any Revelations type element in the Storm series, just that that phrase could signify the World. While I’m on this subject I might as well elaborate on a possible meaning of the phrase ‘Cosmic Memoirs’. I had come across a similar phrase to this before when reading about Rudolf Steiner. Steiner died in 1925 and wrote about higher states of human consciousness. He called it the Cosmic Chronicle or Akhasic Record and what he described this as being was an uninterrupted view/experience of the entire history of man, right from the beginning of time. I wanted to mention this character before in relation to being a possible influence on the evolution of the consciousness element of the Storm series(the ability to view the cosmic chronicle was one of his final steps) but thought I’d hold back on him till now. We’ll never know for sure what sort of reading Stinson and Gerald got up to but while Steiner may seem obscure to most people, he would be well enough known to those interested in the subject. Cosmic Memoirs is the only direct reference to Steiner and that is why I only mention him now but if you delve a little deeper into his idea’s you may be surprised at how much resonates, again this could just be coincidence. My last point in this vein would be to point out another connected philosophical viewpoint. If you accept the existence of a type of universal/folk memory then would it not follow that there be a common consciousness? Ludwig Wittgenstein theorised about just such a possibility in his ‘no ownership of mind’ theory. If you choose to follow up this line of inquiry prepare yourself for mind scrambling scenarios where amnesiac’s wake up in hospitals screaming, “Someone is in pain, I don’t know who!”. This might even shed light on that enigmatic Stinson quote where he’s asked for some last thoughts in the Beere interview, “Look in the mirror, do you see you or do you see me?". Musically Shifted Phases is way up my list, there is a varied palette of sounds to be found here. In particular, the piano on ‘Lonely Journey of the Comet Bopp’ really makes you feel like your watching it move through space. There are so many standout tracks here I would only end up listing the bulk of the album, lets just say it’s another triumph then. Of course there is a ‘Production by Dimensional Waves’ credit, but no other information relevant to figuring out what its all about. Although on the CD there is the line 'In memory of James Marcel Stinson who died in September 2002'. Luckily the titles give us all we need to know. To follow the CD track-list in order, as we also did with it’s opposing bookend, Harnessed The Storm, made the most sense to me. The first thing which might surprise you in space travel is that there is a ‘Solar Wind’, you would also need to be wary of running into the path of radioactive solar flares but that's beside the point. A ‘White Dwarf’ star would be a phenomena you could encounter on your way, maybe in this context it could even be used as an ‘Astronomical Guidepost’ for our journey (also the name of a track on Grava 4). ‘Waveform Cascades’ could mean a lot of things but ‘Dance of the Celestial Druids’ sounds like another astronomical phenomenon. I wouldn’t be surprised if there is a druid like figure in the constellation chart alongside Leo etc, another guidepost in our journey? ‘The Freak Show’ again sounds like an astral happening which now makes three possible astronomical guideposts we have encountered. ‘Implosive Regions’ sounds like we are now leaving our own galaxy and navigating the asteroid belt, a dangerous region indeed. It should come as no surprise then that we should now encounter at this furthest point the 'Lonely Journey of the Comet Bopp’. We now cross into some ‘Neptune’s Lair’ type imagery because everything beyond this point is the unknown. We know that James Stinson was a jazz fan and having talked of possible philosophical influences earlier, we have on ‘Crossing of the Sun-Ra Nebula’ an acknowledgement of a definite influence. You need go no further back than Sun Ra to find in him the forefather of musicians creating imaginary worlds to go with their music. Once we cross this nebula we encounter ‘Scattering Pulsars’. The following ‘Alien Vessel Distress Call’ again makes me think of classic ‘Neptune’s Lair’ type scenarios. Who exactly the alien craft belongs to could be either us, as we would be the aliens in this universe or them. The final track is ‘Flux’ which of course means fluctuation or change. If we have followed the instructions so far we will have experienced both a change of consciousness and now a change of place to fit that consciousness. In many ways I feel like the journey ended for me with L.I.F.E., you should read my last paragraph there again if you want a neat summary of and praise for the Storm series. Mind you, Shifted Phases may only be about a physical journey but it is one we could not have even conceptualised about taking before understanding the previous Storms. It only seemed easier to figure out in comparison to what had gone before. It's worth noting that the Storm series follows an ancient tradition in story telling known as the mono-myth, as identified by Joseph Campbell. He boiled this down to any account of growing up, leaving home, a search, a trail, a gift and a return. It is a process of meeting and integrating the shadow or a lost or unrecognised part of the self. Where the shadow is not integrated this archetype remains potent and unfulfilled. The persona longs for its journey of symbolic death and the awakening to the authentic self. As Drexciya, James Stinson and Gerald Donald gave us great music, but by not explaining themselves and creating a mystery they gave us the use of our imagination. This is only my interpretation, to have your own is more important. This is not the end, Grava 4 is next.